Visual art of The United States and/or American art encompasses the history of painting and visual art in the United States. In the late 18th and early 19th centuries, artists primarily painted landscapes and portraits in a realistic style based mainly on Western painting and European arts. A parallel development taking shape in rural America was the American craft movement, which began as a reaction to the industrial revolution. Developments in modern art in Europe came to America from exhibitions in New York City such as the Armory Show in 1913. After World War II, New York replaced Paris as the center of the art world. Since then many American movements have shaped Modern and Postmodern art. Art in the United States today covers a huge range of styles. After the Declaration of Independence in 1776, which marked the official beginning of the American national identity, the new nation needed a history, and part of that history would be expressed visually. Most of early American art (from the late 18th century through the early 19th century) consists of history paintingand especially portraits. As in Colonial America, many of the painters who specialized in portraits were essentially self-taught; notable among them areJoseph Badger, John Brewster, Jr., and William Jennys. The young nation’s artists generally emulated the style of British art, which they knew throughprints and the paintings of English-trained immigrants such as John Smibert (1688–1751) and John Wollaston (active 1742–75). Robert Feke (1707–52), an untrained painter of the colonial period, achieved a sophisticated style based on Smibert’s example. Charles Willson Peale, who gained much of his earliest art training by studying Smibert’s copies of European paintings, painted portraits of many of the important figures of the American Revolution. Peale’s younger brother James Peale and four of Peale’s sons—Raphaelle Peale, Rembrandt Peale, Rubens Peale and Titian Peale—were also artists. Painters such as Gilbert Stuart made portraits of the newly elected government officials, which became iconic after being reproduced on various U.S. Postage stamps of the 19th century and early 20th century, while John Singleton Copley painted emblematic portraits for the increasingly prosperous merchant class, including a portrait of Paul Revere (ca. 1768–70). The original version of his most famous painting, Watson and the Shark(1778), is in the collection of The National Gallery of Art while there is another version in the Boston Museum of Fine Arts and a third version in theDetroit Institute of Arts. Benjamin West painted portraits as well as history paintings of the French and Indian War. West also worked in London where many American artists studied under him, including Washington Allston, Ralph Earl, James Earl, Samuel Morse, Charles Willson Peale, Rembrandt Peale, Gilbert Stuart, John Trumbull, Mather Brown, Edward Savage and Thomas Sully. John Trumbull painted large battle scenes of theRevolutionary War. When landscape was painted it was most often done to show how much property a subject owned, or as a picturesque background for a portrait. Gilbert Stuart, The Skater, 1782, National Gallery of Art,Washington, D.C.
merica’s first well-known school of painting—the Hudson River School—appeared in 1820. Thomas Colepioneered the movement which included Albert Bierstadt, Frederic Edwin Church, Thomas Doughty and several others. As with music and literature, this development was delayed until artists perceived that the New World offered subjects unique to itself; in this case the westward expansion of settlement brought the transcendent beauty of frontier landscapes to painters’ attention. The Hudson River painters’ directness and simplicity of vision influenced and inspired such later artists asJohn Kensett and the Luminists; as well as George Inness and the tonalists (which included Albert Pinkham Ryder and Ralph Blakelock among others), and Winslow Homer (1836–1910), who depicted rural America—the sea, the mountains, and the people who lived near them. The Hudson River School landscape painter Robert S. Duncanson was one of the first important African American painters. John James Audubon, an ornothologist whose paintings documented birds, was one of the most important naturalist artists in America. His major work, a set of colored prints entitled The Birds of America (1827–1839), is considered one of the finest ornithological works ever completed. Edward Hicks was an Americanfolk painter and distinguished minister of the Society of Friends. He became a Quaker icon because of his paintings. Paintings of the Great West, many of which emphasized the sheer size of the land and the cultures of the native people living on it, became a distinct genre as well. George Catlin depicted the West and its people as honestly as possible.George Caleb Bingham, and later Frederick Remington, Charles M. Russell, the photographer Edward S. Curtis, and others recorded the American Western heritage and the Old American West through their art. History painting was a less popular genre in American art during the 19th century, allthough Washington Crossing the Delaware, painted by the German-born Emanuel Leutze, is among the best-known American paintings. The historical and military paintings of William B. T. Trego were widely published after his death (according to Edwin A. Peeples, “There is probably not an American History book which doesn’t have (a) Trego picture in it”). Portrait painters in America in the 19th century included untrained limners such as Ammi Phillips, and painters schooled in the European tradition, such as Thomas Sully and G.P.A. Healy. Middle-class city life found its painter in Thomas Eakins (1844–1916), an uncompromising realist whose unflinching honesty undercut the genteel preference for romantic sentimentalism. As a result he was not notably successful in his lifetime, although he has since been recognized as one of America’s most significant artists. One of his students was Henry Ossawa Tanner, the first African-American painter to achieve international acclaim. A trompe-l’oeil style of still-life painting, originating mainly in Philadelphia, included Raphaelle Peale (one of several artists of the Peale family), William Michael Harnett, and John F. Peto. Controversy soon became a way of life for American artists. In fact, much of American painting and sculpture since 1900 has been a series of revolts against tradition. “To hell with the artistic values,” announced Robert Henri (1865–1929). He was the leader of what critics called the Ashcan school of painting, after the group’s portrayals of the squalid aspects of city life. 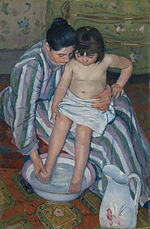 American realism became the new direction for American visual artists at the turn of the 20th century. 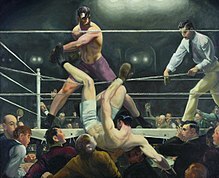 The Ashcan painters George Bellows, Everett Shinn, George Benjamin Luks, William Glackens, and John Sloan were among those who developed socially conscious imagery in their works. The photographer Alfred Steiglitz (1864–1946) led the Photo-Secession movement, which created pathways for photography as an emerging art form. Soon the Ashcan school artists gave way tomodernists arriving from Europe—the cubists and abstract painters promoted by Stieglitz at his 291 Galleryin New York City. 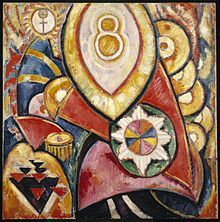 John Marin, Marsden Hartley, Alfred Henry Maurer, Arthur B. Carles, Arthur Dove,Henrietta Shore, Stuart Davis, Stanton MacDonald-Wright, Morgan Russell, Patrick Henry Bruce, Andrew Dasburg, Georgia O’Keeffe, and Gerald Murphy were some important early American modernist painters. Early modernist sculptors in America include William Zorach, Elie Nadelman, and Paul Manship. After World War I many American artists rejected the modern trends emanating from the Armory Show and European influences such as those from theSchool of Paris. Instead they chose to adopt various—in some cases academic—styles of realism in depicting American urban and rural scenes. Grant Wood, Reginald Marsh, Guy Pène du Bois, and Charles Sheeler exemplify the realist tendency in different ways. Sheeler and the modernists Charles Demuth and Ralston Crawford were referred to as Precisionists for their sharply defined renderings of machines and architectural forms. Edward Hopper, who studied under Henri, developed an individual style of realism by concentrating on light and form, and avoiding overt social content. Following the first World War, the completion of the Santa Fe Railroad enabled American settlers to travel across the west, as far as the California coast. New artists’ colonies started growing up around Santa Fe andTaos, the artists’ primary subject matter being the native people and landscapes of the Southwest. 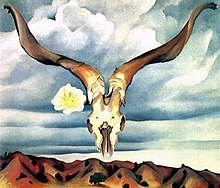 Images of the Southwest became a popular form of advertising, used most significantly by the Santa Fe Railroad to entice settlers to come west and enjoy the “unsullied landscapes.” Walter Ufer, Bert Geer Phillips, E. Irving Couse, William Henry Jackson, Marsden Hartley, Andrew Dasburg, and Georgia O’Keeffe were some of the more prolific artists of the Southwest. The Harlem Renaissance was another significant development in American art. In the 1920s and 30s a new generation of educated and politically astute African-American men and women emerged who sponsored literary societies and art and industrial exhibitions to combat racist stereotypes. The movement, which showcased the range of talents within African-American communities, included artists from across America, but was centered in Harlem. The work of the Harlem painter andgraphic artist Aaron Douglas and the photographer James VanDerZee became emblematic of the movement. Artists associated with the Harlem Renaissance include Romare Bearden, Jacob Lawrence, Charles Alston, Augusta Savage, Archibald Motley, Lois Mailou Jones, Palmer Hayden and Sargent Johnson. 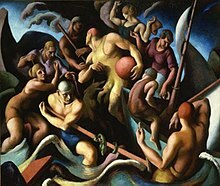 Thomas Hart Benton, People of Chilmark (Figure Composition), 1920, Hirshhorn Museum and Sculpture Garden, Washington, DC. When the Great Depression hit, president Roosevelt’s New Deal created several public arts programs. The purpose of the programs was to give work to artists and decorate public buildings, usually with a national theme. The first of these projects, the Public Works of Art Project (PWAP), was created after successful lobbying by the unemployed artists of the Artists’ Union. The PWAP lasted less than one year, and produced nearly 15,000 works of art. It was followed by the Federal Art Project of the Works Progress Administration (FAP/WPA) in 1935, which funded some of the most well-knownAmerican artists. The style of much of the public art commissioned by the WPA was influenced by the work of Diego Rivera and other artists of the contemporary Mexican muralism movement. 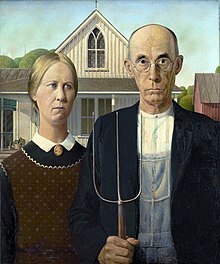 Several separate and related movements began and developed during the Great Depression includingAmerican scene painting, Regionalism, and Social Realism. Thomas Hart Benton, John Steuart Curry, Grant Wood, Ben Shahn, Joseph Stella,Reginald Marsh, Isaac Soyer, Raphael Soyer, and Jack Levine were some of the best known artists. Not all of the artists who emerged in the years between the wars were Regionalists or Social Realists; Milton Avery’s paintings, often nearly abstract, had a significant influence on several of the younger artists who would soon become known as Abstract Expressionists. Joseph Cornell, inspired bySurrealism, created boxed assemblages incorporating found objects and collage. The first generation of abstract expressionists included Jackson Pollock, Willem De Kooning, Mark Rothko, Franz Kline, Arshile Gorky, Robert Motherwell, Clyfford Still, Barnett Newman, Adolph Gottlieb, Phillip Guston, Ad Reinhardt, James Brooks, Richard Pousette-Dart, William Baziotes,Mark Tobey, Bradley Walker Tomlin, Theodoros Stamos, Jack Tworkov David Smith, and Hans Hofmann, among others. Milton Avery, Lee Krasner,Louise Bourgeois, Alexander Calder, Tony Smith, Morris Graves and others were also related, important and influential artists during that period. Though the numerous artists encompassed by this label had widely different styles, contemporary critics found several common points between them. Many first generation abstract expressionists were influenced both by the Cubists’ works (which they knew from photographs in art reviews and by seeing the works at the 291 Gallery or the Armory Show), by the European Surrealists, and by Pablo Picasso, Joan Miró and Henri Matisse as well as the Americans Milton Avery, John D. Graham, and Hans Hofmann. Most of them abandoned formal composition and representation of real objects. Often the abstract expressionists decided to try instinctual, intuitive, spontaneous arrangements of space, line, shape and color. 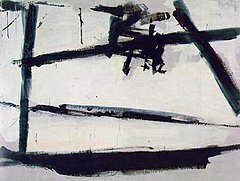 Abstract Expressionism can be characterized by two major elements: the large size of the canvases used (partially inspired by Mexican frescoes and the works they made for the WPA in the 1930s), and the strong and unusual use of brushstrokes and experimental paint application with a new understanding of process. The emphasis and intensification of color and large open expanses of surface were two of the principles applied to the movement called Color field Painting. Ad Reinhardt, Adolph Gottlieb, Mark Rothko, Clyfford Still and Barnett Newman were categorized as such. Another movement was called Action Painting, characterized by spontaneous reaction, powerful brushstrokes, dripped and splashed paint and the strong physical movements used in the production of a painting. Jackson Pollock is an example of an Action Painter: his creative process, incorporating thrown and dripped paint from a stick or poured directly from the can, revolutionized painting methods. Willem de Kooning famously said about Pollock “he broke the ice for the rest of us.” Ironically Pollock’s large repetitious expanses of linear fields are characteristic of Color Field painting as well, as art critic Michael Fried wrote in his essay for the catalog of Three American painters: Kenneth Noland,Jules Olitski, Frank Stella at the Fogg Art Museum in 1965. Despite the disagreements between art critics, Abstract Expressionism marks a turning-point in the history of American art: the 1940s and 1950s saw international attention shift from European (Parisian) art, to American (New York) art. During the 1950s abstract painting in America evolved into movements such as Neo-Dada, Post painterly abstraction, Op Art, hard-edge painting,Minimal art, Shaped canvas painting, Lyrical Abstraction, and the continuation of Abstract expressionism. As a response to the tendency toward abstraction imagery emerged through various new movements like Pop Art, the Bay Area Figurative Movement and later in the 1970s Neo-expressionism. Lyrical Abstraction along with the Fluxus movement and Postminimalism (a term first coined by Robert Pincus-Witten in the pages of Artforum in 1969) sought to expand the boundaries of abstract painting and Minimalism by focusing on process, new materials and new ways of expression. Postminimalism often incorporating industrial materials, raw materials, fabrications, found objects, installation, serial repetition, and often with references to Dada and Surrealism is best exemplified in the sculptures of Eva Hesse. 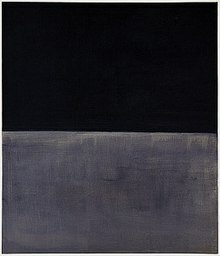 Lyrical Abstraction, Conceptual Art, Postminimalism, Earth Art, Video, Performance art, Installation art, along with the continuation of Fluxus, Abstract Expressionism, Color Field Painting, Hard-edge painting,Minimal Art, Op art, Pop Art, Photorealism and New Realism extended the boundaries of Contemporary Art in the mid-1960s through the 1970s. During the 1960s, 1970s and 1980s painters as powerful and influential as Adolph Gottlieb, Phillip Guston, Lee Krasner, Cy Twombly, Robert Rauschenberg, Jasper Johns, Richard Diebenkorn, Josef Albers, Elmer Bischoff, Agnes Martin, Al Held, Sam Francis, Kenneth Noland, Jules Olitski,Ellsworth Kelly, Morris Louis, Gene Davis, Frank Stella, Joan Mitchell, Friedel Dzubas, Paul Jenkins and younger artists like Brice Marden, Robert Mangold, Sam Gilliam, Sean Scully, Elizabeth Murray, Walter Darby Bannard, Larry Zox, Ronnie Landfield, Ronald Davis, Dan Christensen, Susan Rothenberg, Ross Bleckner, Richard Tuttle, Julian Schnabel, Peter Halley, Jean-Michel Basquiat, Eric Fischl and dozens of others produced vital and influential paintings. Members of the next artistic generation favored a different form of abstraction: works of mixed media. Among them were Robert Rauschenberg(1925–2008) and Jasper Johns (1930- ), who used photos, newsprint, and discarded objects in their compositions. Pop artists, such as Andy Warhol (1930–1987), Larry Rivers (1923–2002), and Roy Lichtenstein (1923–1997), reproduced, with satiric care, everyday objects and images of American popular culture—Coca-Cola bottles, soup cans, comic strips. Realism has also been continually popular in the United States, despite modernism’s impact; the realist tendency is evident in the city scenes of Edward Hopper, the rural imagery of Andrew Wyeth, and the illustrations of Norman Rockwell. In certain places, for example Chicago, Abstract Expressionism never caught on; in Chicago, the dominant art style was grotesque, symbolic realism, as exemplified by the Chicago Imagists Cosmo Campoli (1923–1997), Jim Nutt (1938- ), Ed Paschke (1939–2004), and Nancy Spero (1926–2009). At the beginning of the 21st century Contemporary art in the United States in general continues in several contiguous modes, characterized by the idea of pluralism. The “crisis” in painting and current art and current art criticism today is brought about by pluralism. There is no consensus, nor need there be, as to a representative style of the age. There is an anything goes attitude that prevails; an “everything going on” syndrome; with no firm and clear direction and yet with every lane on the artistic superhighway filled to capacity. Consequently magnificent and important works of art continue to be made in the United States albeit in a wide variety of styles and aesthetic temperaments, the marketplace being left to judge merit. 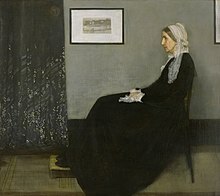 A few American artists of note include: Ansel Adams, John James Audubon, Thomas Hart Benton, Albert Bierstadt, Alexander Calder, Mary Cassatt, Frederic Edwin Church, Thomas Cole,Edward S. Curtis, Richard Diebenkorn, Thomas Eakins, Jules Feiffer, Helen Frankenthaler, Arshile Gorky, Marsden Hartley, Al Hirschfeld, Hans Hofmann, Winslow Homer, Georgia O’Keeffe, Lee Krasner, Franz Kline, Willem de Kooning, Dorothea Lange, Roy Lichtenstein, Morris Louis, John Marin, Agnes Martin, Nampeyo, Jackson Pollock, Man Ray, Robert Rauschenberg, Frederic Remington, Norman Rockwell, Mark Rothko, Albert Pinkham Ryder, Cindy Sherman, David Smith, Frank Stella, Gilbert Stuart, Louis Comfort Tiffany, Andy Warhol, Frank Lloyd Wright, Andrew Wyeth.